I've been without Internet at CWP World Headquarters for the last 10 or so days, so I haven't been able to update the blog. By now, I'm sure everyone is already finished with their holiday shopping and has no need for a suggestion on another wine book to purchase for the wine lover in your life. Plus, there are lots of other book suggestions by every other wine writer out there (Eric Asimov, W. Blake Gray and Dave McIntyre fun the gamut). But what the hell, I'm going to offer one recommendation that you will not find on any other list of wine books. I know you'll be shocked to hear that it is a book about Colorado wine. Two other books on the emerging industry have been published in the past two years, but neither of those offer the information, usefulness and aesthetics of the most recent addition. Granted, I haven't thoroughly read or reviewed either of those two, but I have skimmed through them enough to know that they don't intrigue me. Both of the other books were self-published and written by people unfamiliar with the wine industry, and it shows. They are filled with black and white text and not much more. One is nothing more than a colorless brochure; it is just a list of wineries and contact information with space for the reader to take tasting notes. The other seems to offer a bit more depth and information, but the first paged I opened to contained a factual error (claiming that Chateauneuf du Pape is known for its syrahs) and the author (who for some reason uses a pen name) argued with me about the federal labeling requirements for listing an appellation. That doesn't do a lot to convince me that the book is worth my time. 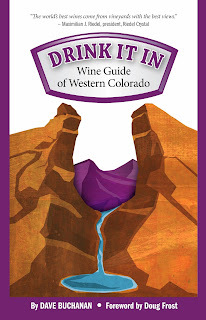 Drink It In: Wine Guide of Western Colorado, by Dave Buchanan, is the best book on Colorado wine that on the market. Buchanan is a longtime wine writer and wine columnist for The Grand Junction Daily Sentinel. He knows the industry and he knows the state. Forewords by Colorado Governor John Hickenlooper and Doug Frost MS, MW provide evidence to the importance, credibility and professionalism of the book. But the meat and potatoes of the book are even more impressive than the introductory statements. 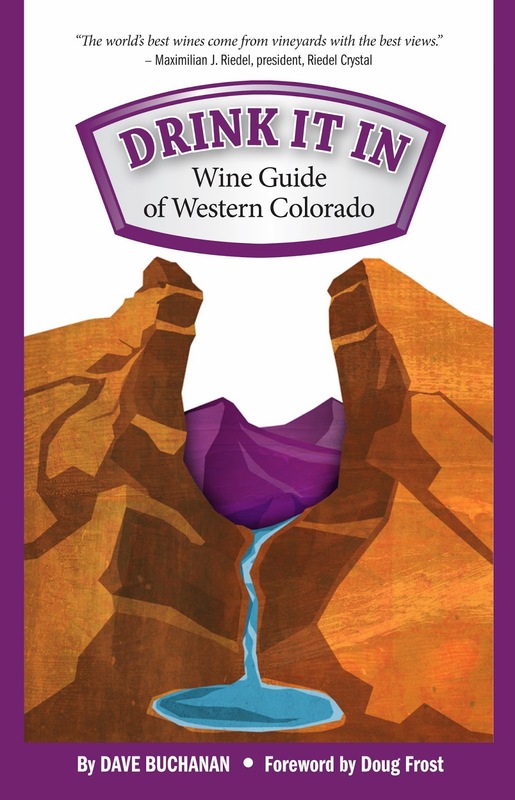 As the title suggests, Drink It In focuses only on the wineries west of the Continental Divide in Colorado. This of course excludes about half of the state's wineries. However, it doesn't feel like it is incomplete in any way. It is chock-full of maps, labels and beautiful photos. As most books on wine regions are organized, it is broken down into regions. There are clear and detailed maps and background information for each region: Grand Valley, Uncompahgre Valley, North Fork Valley and Four Corners. The book is well organized and easy to read. Overall, the book is a great introduction to Colorado wine that novices and enthusiasts alike will find worthwhile. Unlike other popular wine books this year, Drink It In is not supposed to be an all-encompassing tome, a one-sided polemic or a simple coffee table decoration. Some wineries receive more detailed attention than others, but all have the basic info plus a few paragraphs. The end of the book provides supplementary information written by other industry professionals that novices may find more useful. There is a pull-out, water-resistant map of all the wineries in the Grand Valley, but you'll need the book if you'll visiting any of the other regions. You won't be able to sit for the Master Sommelier exam after reading this book, but you'll end up knowing more about Colorado wine than most people who haven't read it! If you're interesting in learning more about Colorado's wine industry, you'll find Drink It In a worthwhile investment.